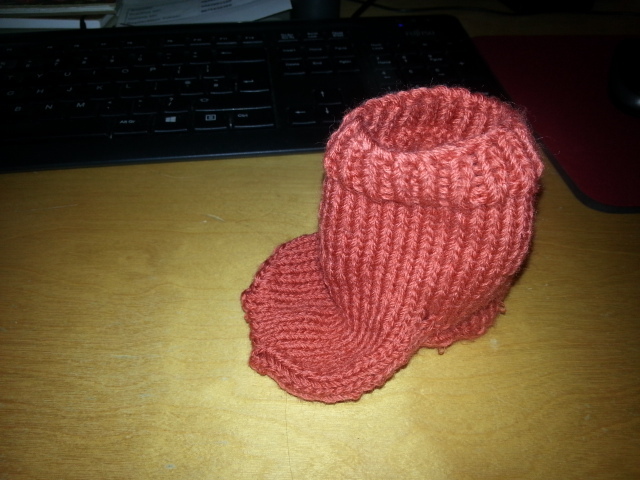 Second sock. Flap heel. Better. Third sock. Short-rowed heel. Not brilliant, but better than the duck-foot one. First of all, the dratted weather. Hate it with a passion, or would if I had the energy. For the last two days it’s been cooler and much more manageable, after some terrific thunderstorms and plenty of much needed rain. But before that it was dreadful. The humidity is the worst thing for me. I can’t imagine going out and sitting in the sun. The most I could do comfortably is shower, put on proper underwear, and summer pyjamas – a loose t-shirt top and loose long shorts. Then I couldn’t do anything all day except sit around inside with all the fans in the house going. We do have a ceiling fan which we have been using at night. The first night or two we couldn’t sleep properly because it hums, but soon got used to it. So I’m really, really pleased that it’s cooler. I don’t care if it rains, the whole country is going brown. Our water butts were empty. I’ve now learned to knit socks. 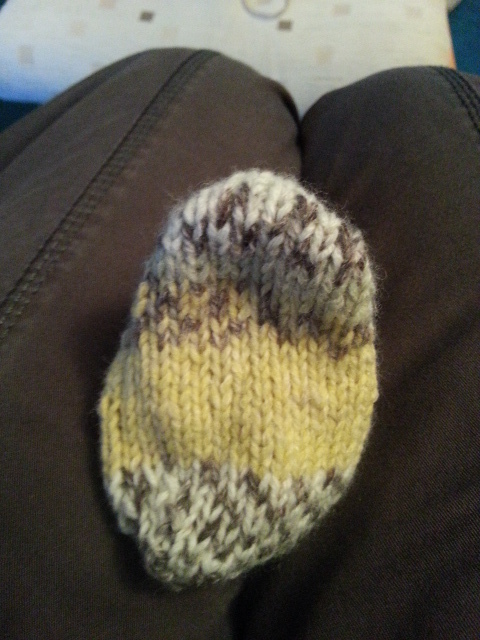 The first sock would fit either a baby hobbit, or a duck with very fat legs, but I turned the heel and grafted the toe. 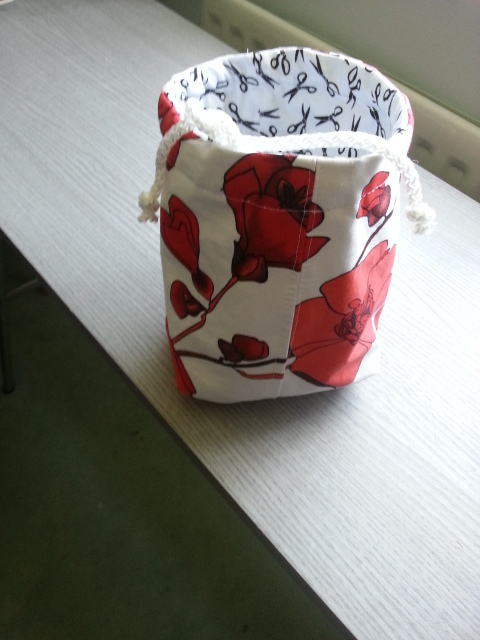 No seams, did it in the round with two circular needles. Very pleased. 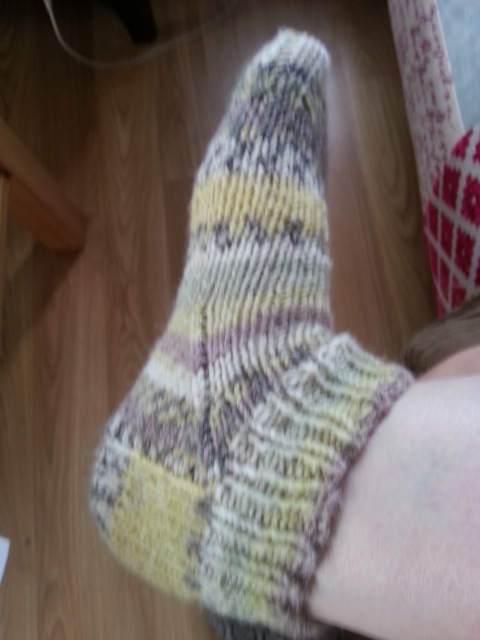 I’m going to practise with more sock patterns and different ways of turning the heel. 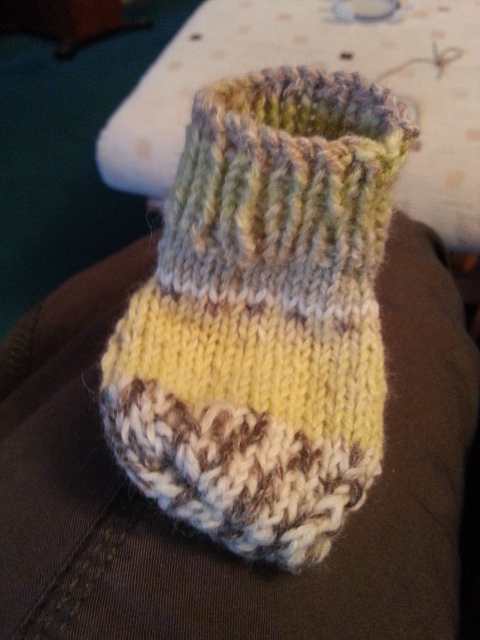 Socks are a small, portable project, and apparently once you’ve worn hand-knitted socks you’re hooked. We shall see. More crocheting too, along the same lines but trying different patterns. However, my KnitPro size 3.00 mm interchangeable needles – one snapped while I was knitting. Very frustrating. It’s never happened to me before. I’ve been knitting for over 50 years, and for the last 20 years with bamboo or wooden needles. But KnitPro will replace that set, and I’ve ordered a fixed and an interchangeable HiyaHiya size 3.00 60 cm needle from The Shop. 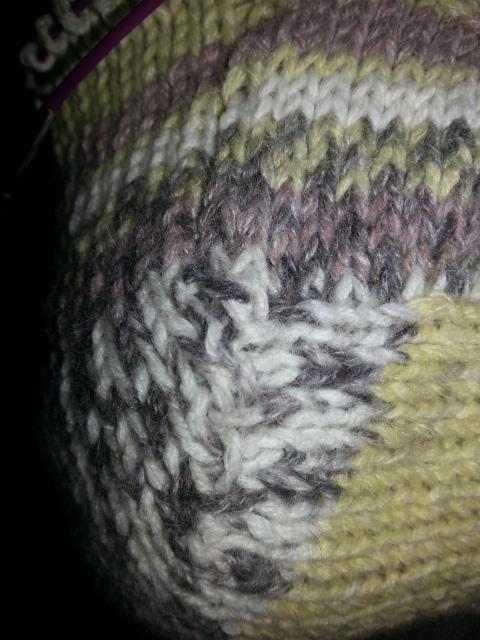 It’s frustrating because I need size 3.00 mm to finish the front band of the Cardigan of Doom which I’ve been knitting. But I shall put that to one side and do a few small projects in the meantime. I also need size 3.00 mm needles for my sock knitting – but in the meantime while I’m just learning I’ll use bigger needles and not worry too much. 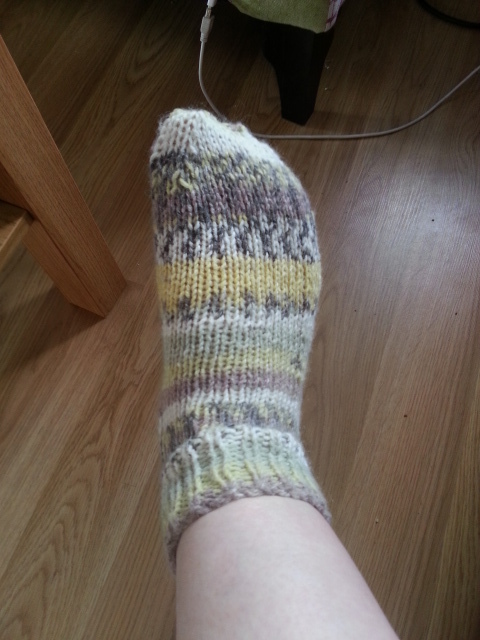 Socks need to be knitted on small needles so that they don’t wear out too quickly and are comfortable. Big needles means big holes between the stitches/rows. My hands – I’m in real trouble with them. The Tramadol (one x 3 times a day) plus the Paracetamol just isn’t doing it. But I’m at the doctor tomorrow, so will see what she says, and have an appointment with the orthopaedic consultant on 5th August. Also have an appointment with a different guy on 22nd August, for my tremor. Sometimes it’s not too bad, but sometimes I can’t get my food to my mouth, which is why I mentioned it to the doctor. The cat has had a small adventure too. An abcess just below her eye. She didn’t seem bothered by it at all, although she was a little surprised when she washed her face, and it hurt. So the vet gave her an antibiotic injection and an anti-inflammatory injection, and she’s fine. If a little less pretty than usual. Hubby is very busy. Labour party, chairing the Patient Participation Group at the local surgery, going to choir and learning to sing. All at the same time. It’s very good. He suffers a little less than me in the heat because of his medication. And he feels the cold worse. So life is exciting on a small scale, leisurely, and relatively calm. I meant to say on yesterday’s blog, and then forgot. Last week I had an ME/CFS crash. It involved sleeping most of every day and then all night. I had to cancel everything I’d planned to do and just leave it till I got better. Some days I couldn’t even shower and dress, because that’s a major “task” when I’m like that. It’s easy to feel depressed and useless, too, but I decided it would just pass. It took all week, but it did pass. I thought I had been very careful, having a sleep every afternoon and only doing one “thing” a day, but clearly not. I suppose it builds up over time. I had already had to stop going to the knitting group twice a week, and have started going on Thursdays one week, and Saturdays another week. The cat needed to go to the vet today. She had an abscess under one eye. It looked like she’d been bitten. The abscess had already burst (on Saturday night while I was wiping it with a tissue!) but she’s had an antibiotic injection and an anti-inflammatory injection too. She doesn’t mind the vet at all, ignores the injection, and is quite keen to explore the surgery. But she hates the car and howls the whole time. Today I sang loudly to drown it out. Worked to an extent . . I was so excited by the men’s final at Wimbledon, when Andy Murray won, I cried and cried. Wonderful, wonderful match. The weather is hot, sunny and humid. Mm. Good for drying washing, not so good for people. So we sit inside with the fans blowing cool, and the cat sits in the shade outside. 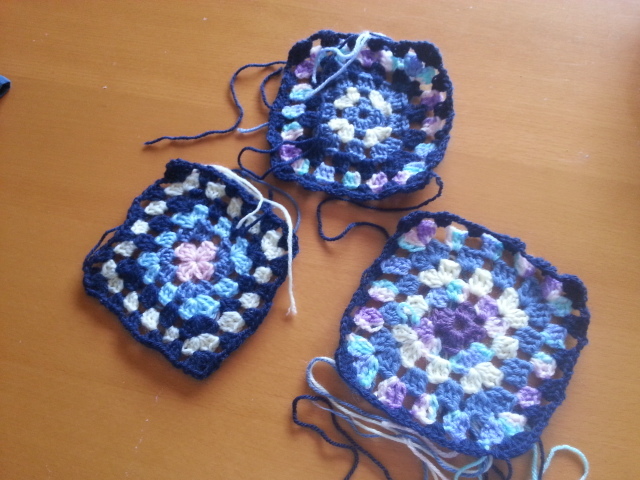 I’ve done another couple of crocheted granny squares. I try to do one round of crochet each day, and discovered quite early on that I was making a mistake in the treble crochet stitch. So I looked it up in two different sources and am now doing it properly. 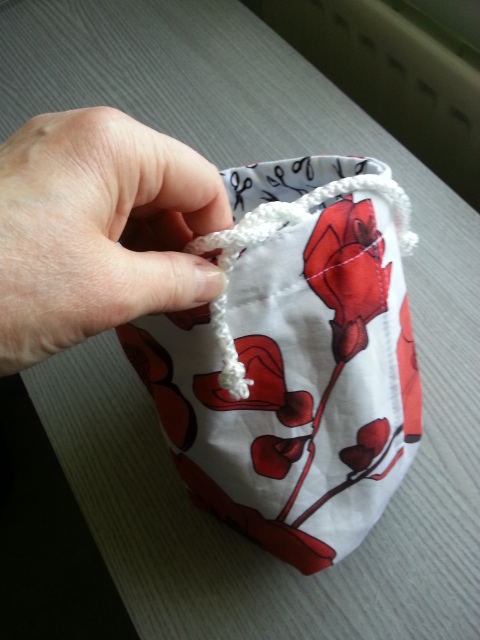 I also made a new project bag – a smaller one. This one is for socks. I’m going to learn how to knit socks on Thursday. Exciting. 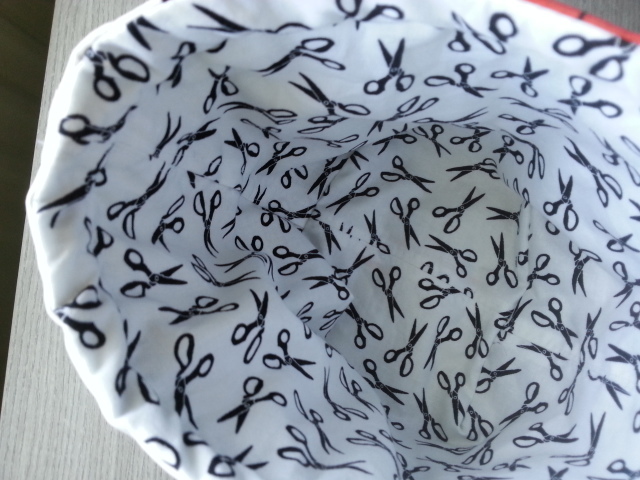 It’s reversible, and this is the inside. 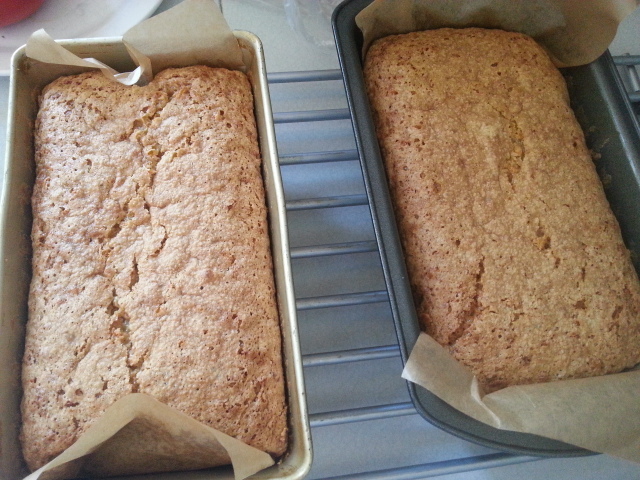 Today I’ve made two carrot cakes – both to freeze. One for Friday when we have family coming over, one just to keep for now.